Today I share Krista Mitchell's Crystal Reiki review with you guys! I recently had the privilege to read Krista's latest book and in short, let me share that it's awesome! Full Disclosure – this is not a sponsored post. I have not received compensation for this post and views expressed are my own. I have to start off with this: the eBook does NOT do this book justice, simply due to the artwork. This is a book you want to OWN because not only is the information amazing, but the artwork is breath taking. Part 1: The Fundamentals: How to properly prepare for giving a Crystal Reiki Session. Part 2: A Healer's Preparation; and how to give a Crystal Reiki Session. Part 4: Self-care for Healers. A history of crystals which is great for learning and/or expanding your knowledge. The history of crystals is fascinating and while I know quite a bit, there were some things I DID NOT know. For instance, Sapphire being linked to Saturn and the qualities attributed to that planet. Something awesome about crystal lovers is that everyone knows something about their history that you didn't know. The fundamentals of Reiki was absolutely fascinating to me and I found the symbols to be so beautiful. Krista dives into healing layouts as well as crystal prescriptions for emotional, physical and spiritual challenges. The healing layouts are from Krista's own experience and while they are easy to use/follow, they're also beautiful to look at. Part 4 about self-care for the healer is one of the best parts of this book. It unpacks an area that not many people talk about. She offers simple tips (eating well, paying attention to your body, staying hydrated, clearing your aura, etc) that we all know but don't pay enough attention to. We are quick to care for others, but not always ourselves. Toward the end of the book, you will find physical, emotional and spiritual healing properties for a number of crystals that Krista mentions in the book and has used in her practice. Why is this good? It's always great to learn about crystals from other people's perspectives and experiences with them DUH! What I personally liked the most though was the section on crystals for aura clearing and healing. Many of us turn to Selenite for clearing and Black Tourmaline, Labradorite or Smokey Quartz for protection. Krista helps you EXPAND your knowledge further in this area! It's just something I really enjoyed. "It's much easier for you to learn if you simply work with them on a regular basis and pay attention to what you feel and experience from them." Crystals are really simple even though there are SO many that do an abundance of things for different areas of your life. When you work with them, that's when magic happens. You learn what that crystal is good for and/or how it can help you. Just make the time and work with them, then clear them of course. "To be a healer is to leave a handprint and a heartprint as your legacy. Your life is your school, your art is your work, your teachers are your clients, your modalities are your tools, and your path of mastery is lifelong. Always remember this, and in good times and bad, moments of triumph of failure, you will stay aligned with your calling and purpose." If you're interested in the field of crystals and/or Reiki and are keen to mix the two areas, then this would be the book for you. I don't feel you need to have a background in Reiki. I don't and this book didn't put me off at all. In fact, this book peaked my interest further into Reiki. The desire to learn Reiki is a little stronger now. If you aren't a healer or considering being healer, I think that you'd still enjoy this book. You could still benefit from using the crystal healing layouts and learning about the crystals. Visit Amazon or check our Krista's website for a list of retailers. I can proudly say that it IS available on Loot.co.za for us in South Africa if you wanted your own paperback copy. 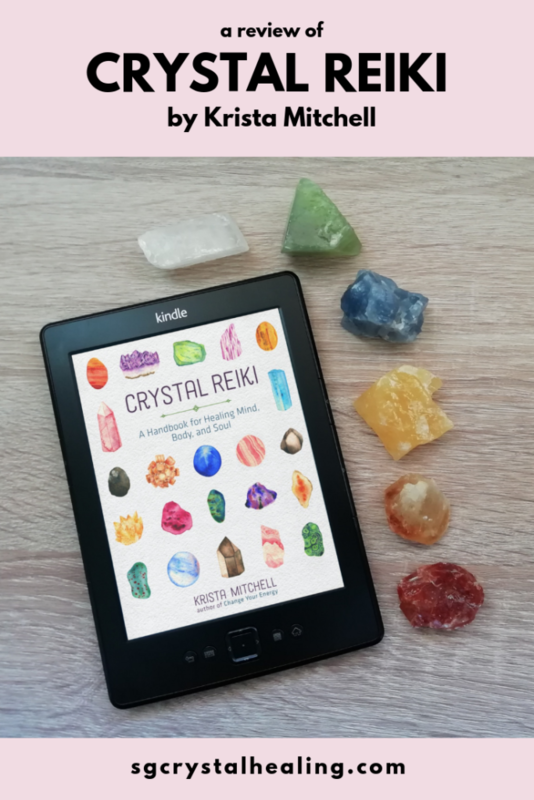 I am keen to know what you thought of Krista Mitchell's Crystal Reiki review? Are you a fan of Krista and is this a book you'd indulge in?